Almost one year ago, Google Cloud Platform launched our GitHub organization, with repositories ranging from tutorials to samples to utilities. This is where developers could find all resources relating to the platform, and get started developing quickly. We started with 36 repositories, with lofty plans to add more over time in response to requests from you, our developers. Many product releases, feature launches, and one logo redesign later, we are now up to 123 repositories illustrating how to use all parts of our platform! Despite some clever naming schemes, it was becoming difficult to find exactly the code that you wanted amongst all of our repositories. Idly browsing through over 100 options wasn’t productive. The repository names gave you an idea of what stacks they used, but not what problems they solved. 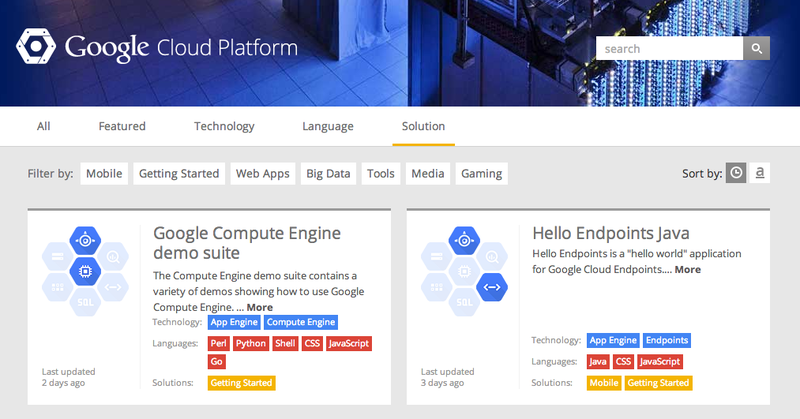 Today, we are making it easier to browse our repositories and search for sample code with our landing page at googlecloudplatform.github.io. Whether you want to find all Compute Engine resources, locate all samples that are available in your particular stack, or find examples that fit your particular area of interest, you can find it with the new GitHub page. We’ll be rotating the repositories in the featured section, so make sure to wander that way from time to time. We are very committed to open source at Google Cloud Platform. Please let us know what kind of samples and tools that you’d like to see from the team. We’re looking forward to many more commits ahead! Google Code-in 2013 - drumroll please!